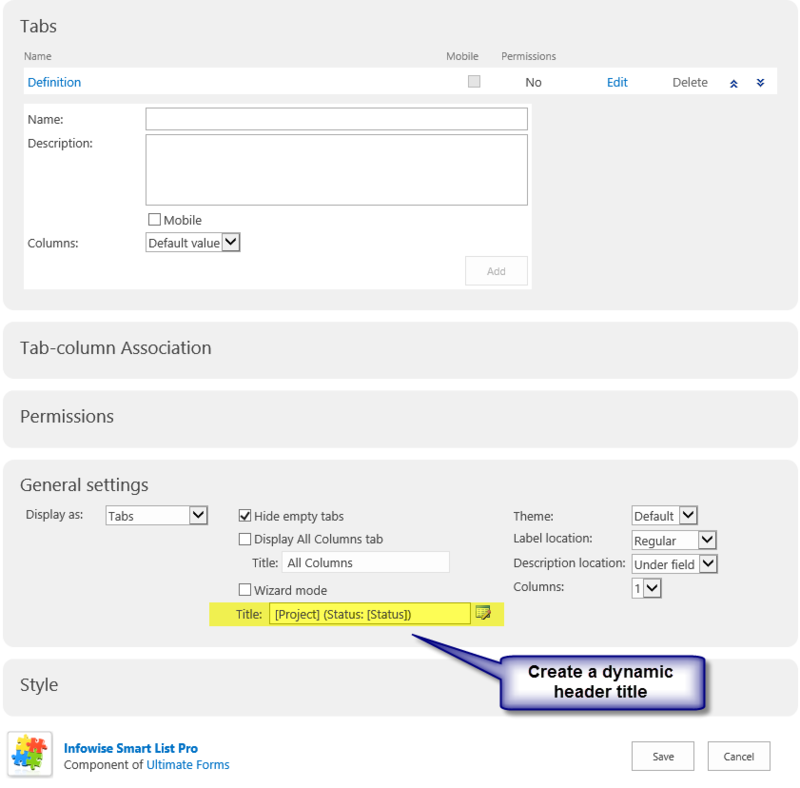 The Tabs and Tab Permissions settings can be used to create a dynamic header that changes depending on whether the user is in add, edit or display mode. In this exercise, we will make the header green when in edit mode and blue when in display mode. This will help users clearly see when they can edit the form. In the list settings screen select Infowise Tabs and tab permissions. You should already have your tabs created and fields assigned to tabs. 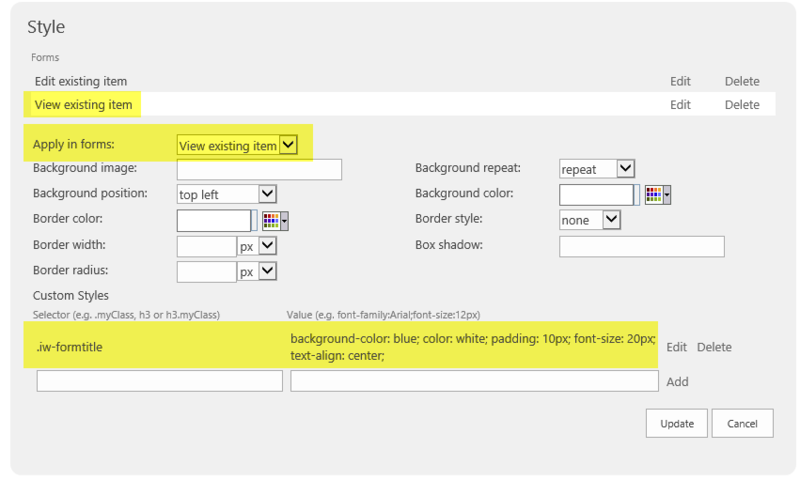 In the General Settings section, use the Title field to apply a header which will appear above the tabs. Use one or more dynamic fields from your list in the header. Always use the "." or "#" before your class or ID on the left side. Always chain together CSS entries for each class. End each property with a ";" following regular CSS rules. Be sure to update the CSS entry, click the update button in the Style section and finally click Save at the bottom of the form. It's easy to miss a step. Work slowly and carefully through the example. Return to the Tabs and Tab Settings area to confirm settings. Look and feel is as important to project tools as the dynamic functionality. There are many possibilities in how you can customize your tools that go beyond the out-of-the-box settings. 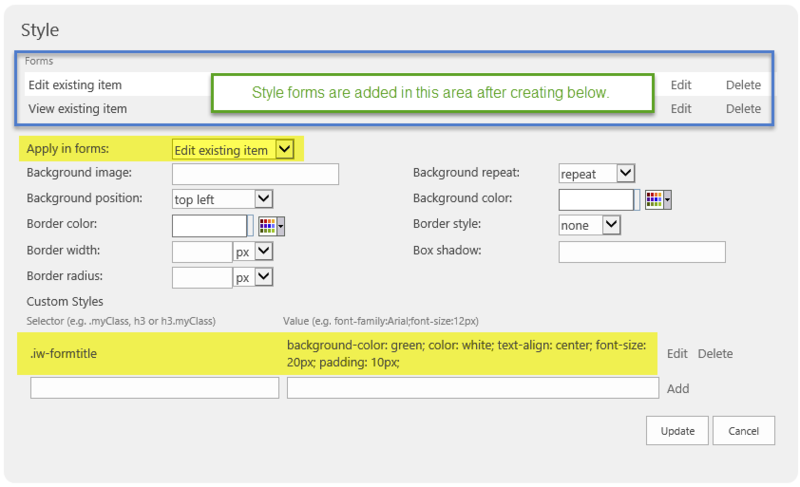 In this example we provide users the benefit of a user interface that changes between edit and display modes to avoid the confusion of these two forms which otherwise look nearly the same to inexperienced SharePoint users.